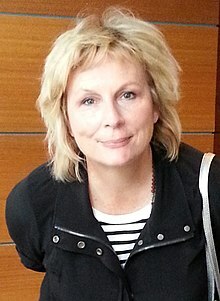 Jennifer Jane Saunders (born 6 July 1958) is an English comedienne, actress and writer. She was born in Sleaford, Lincolnshire. She co-starred with Dawn French in comedy sketch show French and Saunders. She stars in Absolutely Fabulous with Joanna Lumley, Julia Sawalha, Jane Horrocks and June Whitfield. She has guest starred in the American sitcoms Roseanne and Friends. She won the American People's Choice Award for voicing the wicked Fairy Godmother in DreamWorks' animated Shrek 2. Saunders married Adrian Edmondson on 11 May 1985 in Cheshire. They have three daughters: Eleanor "Ella" Rose (born 22 January 1986, Hammersmith, London), Beatrice "Beattie" Louise (born 19 June 1987, Kensington and Chelsea, London), and Freya Domenica (born 16 October 1990, Wandsworth, London). Saunders currently owns a £1 million property with 45 acres (180,000 m2) of land in Chagford, Devon and a home in London. Edmondson and Saunders were estimated to be worth £11 million in 2002. In July 2010, she said that she had breast cancer. She knew about it since October 2009. She is in remission following a lumpectomy, chemotherapy and radiotherapy. Along with Dawn French, Saunders declined an OBE in 2001. In 2003, she was listed in The Observer as one of the 50 funniest acts in British comedy. Saunders was 93rd out of E! 's 100 Sexiest British Stars. She also was 18th for "Best British Role Models for teenage girls in Britain" by Good Housekeeping magazine. 1998: Friends in the episodes "The One With Ross' Wedding" (parts 1 and 2) and "The One After Ross Says Rachel"
↑ 1.0 1.1 "Marriages and Births England and Wales 1984-2006". Findmypast.co.uk. Retrieved 2010-10-07. ↑ "Beatrice Edmondson - England & Wales, Birth Index: 1916-2005 - Ancestry.co.uk". Search.ancestry.co.uk. Retrieved 2010-10-07. ↑ "Freya Edmondson - England & Wales, Birth Index: 1916-2005 - Ancestry.co.uk". Search.ancestry.co.uk. Retrieved 2010-10-07. ↑ 4.0 4.1 Neil Sears and Alison Bowyer. Saunders swaps London for Devon — dailymail.co.uk. Retrieved 5 October 2007. ↑ "Jennifer Saunders's secret cancer battle". Melbourne: The Age. 2010-07-09. Retrieved 9 July 2010. ↑ Nathan, Sara (8 July 2010). "Jennifer Saunders: My battle to beat breast cancer". Daily Mail. London. ↑ "BBC News - Jennifer Saunders reveals her breast cancer fight". Bbc.co.uk. 8 July 2010. Retrieved 2010-10-07. ↑ Yasmin Alibhai-Brown. It is an honour to stand among the refuseniks — independent.co.uk. Retrieved 11 May 2007. This page was last changed on 2 January 2019, at 12:58.